These armless student stacking chairs from OFM are part of the designer inspired Rico series. 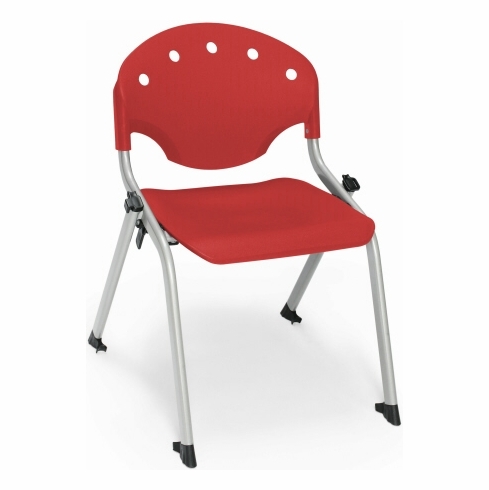 Features include a durable polypropylene seat & backrest shell available in your choice of (6) different colors, 300 lb. weight capacity, 14" seat height, greenguard indoor air quality certified, silver powder-coat painted steel frame, stackable up to 15 chairs high and built-in ganging brackets for linking chairs into rows. These stacking chairs ship fully assembled for fast and easy set-up. Dimensions: Seat Size: 14"W x 13.25"D. Back Size: 16"W x 11"H. Seat Height: 14"H. Overall: 25.5"H x 18"W x 17"D. Weight: 11 lbs. ea. Limited lifetime warranty from OFM.